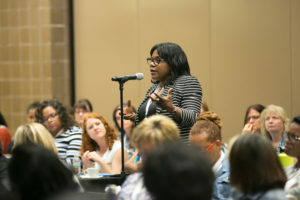 AWHONN Past President and Executive Director, Women and Infant Division, DeKalb Medical Rose Horton, MSM, RNC shares why this year’s AWHONN Leadership Summit (Saturday, June 23rd in Tampa) will especially be meaningful. Join Rose and other recognized leaders and your clinical colleagues at this year’s Summit, where we hope to change the trajectory of maternal mortality. Develop strategies to address health disparities within the healthcare setting in order to improve health outcomes for women and families. You can also earn up to 6.25 CNE credits for attending. Are you concerned about the state of maternal health in the United States? How does race and ethnicity impact women’s experiences with health care and shape their health outcomes? Have you experienced or witnessed inequities within maternal health care ? Are you aware of the role workforce diversity plays in maternal outcomes? Do you want to know more about these trends and the role you can play in turning them around? During the AWHONN 2018 Leadership Summit, you will explore these issues and learn what nursing and public health leaders are doing to change practice and outcomes. Discover the patient’s perspective as maternal health advocate, Patrisse Cullors, shares the value of listening to women and their families, informed by her own experience with postpartum complications. Expand your understanding of why health disparities exist and the social determinants of health and equity. Dr. Monica McLemore, nursing professor at the University of California at San Francisco, will explain the evidence underlying disparities. Learn how one healthcare system and its community have embarked on decreasing disparities for women and infants. Andria Cornell, of the Association of Maternal and Child Health Programs, will share how the Alliance for Innovation on Maternal Health’s (AIM) bundle on reducing peripartum racial and ethnic disparities is being implemented in New York. Explore why increasing diversity in the nursing workforce matters. Maureen Chadwick, CNO of the Saint Vincent Health System, will share results of her research on racial and ethnic dynamics in the nursing workforce and discuss the implications of broadening diversity in our workforce. Understand your role as a nurse leader to positively impact and improve maternal outcomes for every woman. Breakout group sessions will allow attendees to brainstorm strategies to improve nursing culture and equitable care in their own settings.